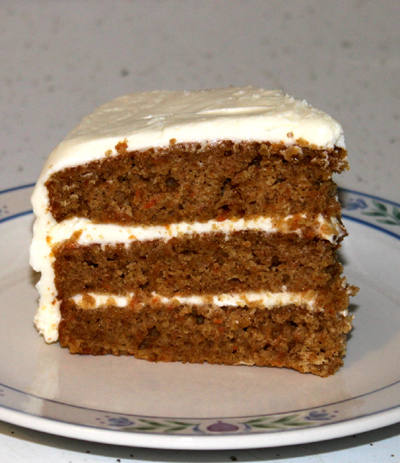 I rarely make carrot cake....I'm talking every couple years I might bake one up. ;) I had this recipe bookmarked from long ago so it was the lucky "I have a craving" winner. Delicious, moist cake. The recipe is definitely a keeper. Not the most level cake I have ever created which is why it must be eaten quickly to destroy the evidence of imperfection....that's my reasoning and I'm sticking with it...ehehehe. In a bowl, combine the flour, baking powder, baking soda, salt, cinnamon, and ginger. Set aside. In a large bowl mix the sugar, brown sugar and oil. Add in the eggs and vanilla extract. Beat until well mixed. Add in flour mixture, alternately with the milk. Fold in the shredded carrot. Pour batter into 3 8 inch round greased cake pans. Bake at 350 for 15 to 20 minutes or until cake tests as done. Let cool in pans for several minutes before turning out to continue cooling. To prepare frosting, mix together cream cheese, butter until smooth. Add in powder sugar and beat until fluffy. Frost cake and chill until ready to serve.